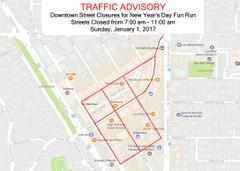 The 2017 New Year's Day Fun Run sponsored by the City of Los Altos Recreation & Community Services Department will take place on Sunday, January 1, 2017 from 9:00 a.m. to 11:00 a.m. in downtown Los Altos. Streets will be re-opened at 11:30 a.m. following the conclusion of the event. The Los Altos Police Department wishes you a safe and happy New Year!